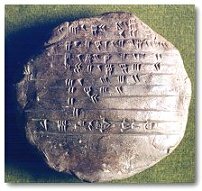 Once people in West Asia figured out how to write down numbers, about 3500 BC, they quickly began to want to use cuneiform to write down other mathematical ideas. The earliest example of this that we have is from about 2700 BC. It shows a multiplication table to help people figure out the area of a space by multiplying width by length. The first column is the width, the second is the length, and the third column is the area. It uses a system for writing down large numbers in base 60 (the way our clocks work today). 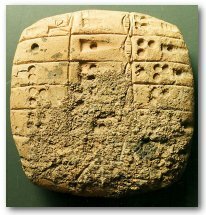 This tablet, from about 2000 BC, was a school math book for teaching kids how to calculate inheritance. The problem asks how much each of seven boys would get when their father died, according to Babylonian law. Apparently the law said they should each get a different proportion, with the oldest getting the most and the younger kids less and less. Whoever did the math worked up from the bottom (which was not normal), and also made a mistake in his or her calculations! Here’s a Babylonian math problem you could try to solve yourself. Are you as smart as Babylonian kids? By the time of the Babylonians, mathematicians were working out quadratic equations like the Pythagorean Theorem, computing square roots and cube roots, and the factors of sixty (because they often worked in base 60). They were working on ways to approximate the value of pi. Then Assyrian mathematicians, working around 1000 BC, had the idea of dividing the circle into 360 degrees (still working in base 60, so 360 = 6 x 60). We still use that Assyrian system today whenever we talk about circles, or about the angles of a triangle. Who first predicted a solar eclipse? Thales, working under Lydian political control in Miletus (modern Turkey) in the 630s BC, found ways to calculate when there would be an eclipse of the sun or the moon. Thales also found a way to calculate the height of an Egyptian pyramid by measuring its shadow, and proved various geometrical theorems. Thales’ student Anaximander, who was also from Miletus, worked on building a better sundial to measure time. Probably people had used their fingers as a kind of calculator since the Stone Age. Traders and shop-keepers and tax collectors, who needed to add and multiply quickly, had a very fast system of counting on the knuckles of both hands. 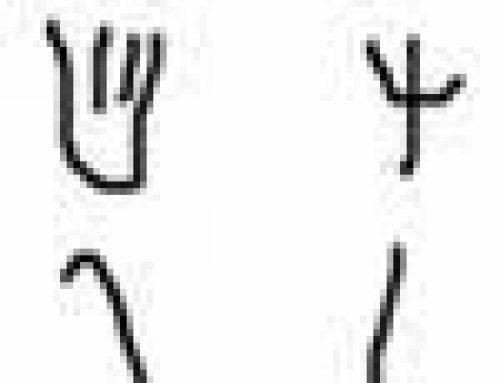 There are twelve knuckles on each hand, which is convenient for using factors of three and four in your multiplication. 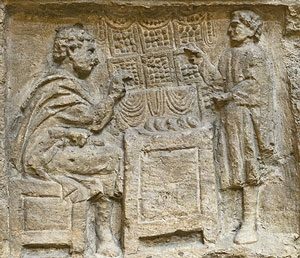 During the Persian Empire, around 500 BC, people first began to use the abacus. Nobody knows whether the abacus was invented in Iran or China. It may have come into use in both places about the same time, thanks to the beginning of the Silk Road. An abacus is a way of calculating large numbers quickly by moving pebbles along grooves dug into dirt, or beads along wires. People kept on using their knuckles, but the abacus made the transaction clear to both people involved, and allowed you to multiply and divide larger numbers quickly. 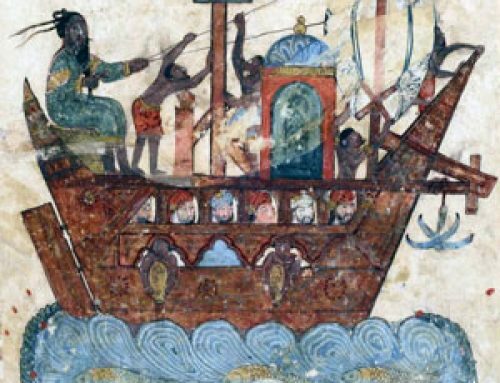 With the development of trade and more travel along the Silk Road between China, India, and West Asia, in the 300s BC, Greek mathematicians were able to talk to Persian and Indian mathematicians more easily than before. A lot of new ideas about infinity, patterns of numbers, and exponents came out of these conversations. But most importantly, from Egypt to India, all across West Asia, mathematicians began to work more on proving that theorems were always true in every case. About 150 BC, Hipparchus (born in Nicaea, now in Turkey) worked on developing trigonometry, making lists of sines and cosines. Under Parthian and Sassanian rule, scholars continued to bring together knowledge from the countries around them, especially from India. 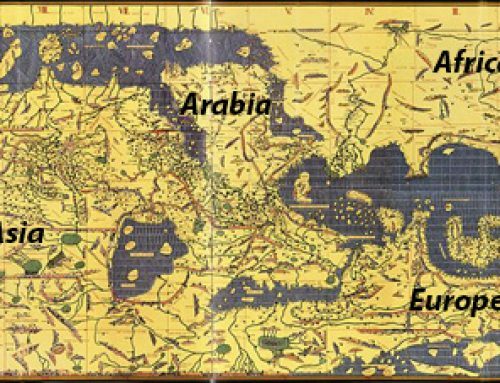 They built a system of math and astronomy based on their Zoroastrian faith, and, like Ptolemy in Egypt and Arya Bhata in India, used trigonometry to make better predictions of the movements of the planets. Then in the 600s AD, the Arabs conquered West Asia and established the Islamic Empire. Around the same time, Indian numbers revolutionized mathematics. You can read about that here. Science in Ancient Mesopotamia, by Carol Moss (1999). Easy reading. On the short side. Cite this page: Carr, K.E. 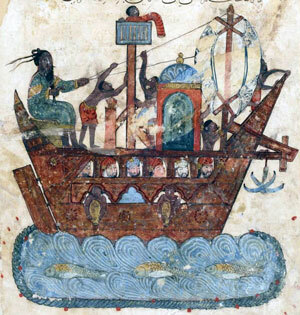 West Asian mathematics – history of math. Quatr.us Study Guides, September 16, 2017. Web. April 20, 2019.